And what a day it is! 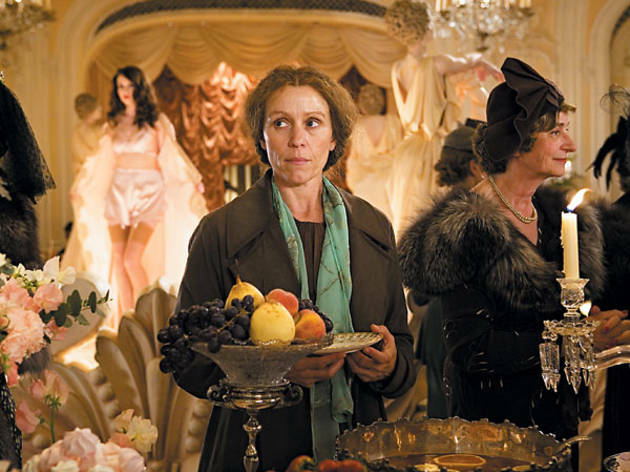 Within 24 hours, frumpy London governess Guinevere Pettigrew (McDormand) finds herself out of work and, through a little deception, ends up employed as the personal assistant of a ditzy blond would-be starlet with the unlikely but delightful name of Delysia Lafosse (Adams). Like an accidental Mary Poppins, the unremarkable Pettigrew somehow manages to solve Delysia’s romantic puzzle, which involves three men she has been keeping on the line—a nightclub-owning gangster, a horndog theatrical producer and a charming but broke piano player. Gee, which one do you think she’ll end up with? And could there be a little patch of happiness for Miss Pettigrew, too? Miss Pettigrew is aiming for the breezy delights of P.G. Wodehouse by way of Feydeau, with Adams doing a convincing impression of Carole Lombard circa My Man Godfrey. If Bharat Nalluri can’t always sustain the fizz, it’s certainly not Adams’s fault; this is another eye-catching performance from the actor, who seems to be specializing in playing dumb (Junebug, Enchanted). By contrast, McDormand and Ciarán Hinds (as a fashion designer who’s smitten with Guinevere) are both working in a lower key of comedy tinged with real emotions. Think of them as the bitters in the champagne cocktail.